Murphy and Gabby are Swainson’s Rainbow Lories – Aside from their personality, they are absolutely identical. They’ve been with me for about 7 years. They are (were) inseparable. Shortly after I first got them, Murphy became incredibly sick. I was having to take her to the vet every week or so, for shots and weigh-ins. Gabby had to go along, because even separating them for an instant, triggered heart-wrenching contact whistles until they were reunited. 2 months ago, one of them – I don’t know which – got hung up in one of their stuffed toys, and started screaming bloody murder. The other one jumped on the first, and they both proceeded in tearing each other apart. Unlike a lot of birds, there is no “beak-fencing” or “toe-jabbing” during an argument. Lories lock up hard and in a matter of the few minutes it took to separate them, both were badly bloodied. Now I understood this fight, no matter how gruesome and upsetting it was. One was screaming, and the others’ instinct for survival kicked in. Nature tells them to silence the one that is possibly attracting a predator. I got out a travel cage, and put Murphy in it, and put Gabby back in the big cage after some much needed doctoring for both. I butted the travel cage up to the big cage so they could get close, but not actually get in contact. After about 2 weeks, I let them get back together, and after a little posturing, all was well. They groomed and cuddled more than any Lovebird pair I’ve ever seen. All was well until 2 weeks ago. I was standing next to their cage, and they were rolling around on the floor, with this somewhat happy noise that I usually hear when they are bathing. As I stood and watched, to my horror, blood and feathers started flyin’. I scrambled to get into the cage and try separate them. They were at it so hard, I had to just grab one by the tail, and pull them both out together. I had to forcibly pry them apart. And no sooner would I get them apart, than they would run at each other again. Fortunately (for them anyway) I was the only one bit and bleeding this time. I didn’t understand this fight at all. There was no screaming; no cries of pain and fear. And Murphy, it turns out is the aggressor this time. Gabby, up until now, has always been the dominant of the two. I understand it even less, since after 2 weeks of separation, they still will not tolerate each other. I tried to let them get back together with no success. Murphy immediately goes for blood, and poor Gabby runs for his life. It just breaks my heart! 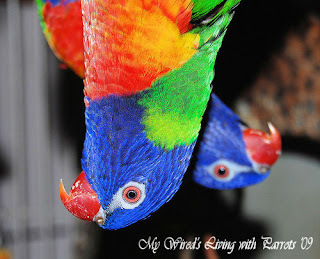 They have always been such a loving couple of birds – they sleep together curled up in a hidey-hut, they feed each other, groom each other constantly – or they did – not anymore. The really sad part is, that while they are separated, the contact calls are constant. The same calls Gabby made whenever Murphy was being examined by the Vet and he was still in the cage. They sit – Murphy in the travel cage, Gabby in the big cage, facing each other – all the while chattering and whistling as if wanting to be together. I will wait another 2 weeks and s try it again, but I’m afraid that if it doesn’t work, they will have to be permanently separated. I can’t sit and watch them 24/7, and the thought of them having another go-round when I’m not around to break it up physically sickens me. Though no more than them having to live permanently separate from each other. As I’ve said before, it breaks my heart, and brings tears to my eyes, even as I write this. Thank you for visiting – if any Lorie Guru happens to read this, and has any thoughts on what is happening, I’d love to hear from you. 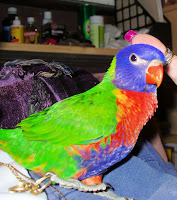 Some of my babies are difficult or near impossible to photograph ~ Pluck and Feather for starters. They are a mated pair of Swainson’s Rainbow Lories. I’ve actually tried to photograph them, but the god-awful noise they make at even the slightest sight of the camera, probably amounts to some very un-repeatable swear words. Pluck got her name, because my poor baby’s previous mate either found her feathers extremely offensive, or was just overly amorous. She has her wing feathers, some body down, a few cheek feathers, but that’s about it. One of my roommates teases she’s the ugliest bird on the planet. Feather, her current mate, on the other hand, is absolutely perfect. Hence the names Pluck and Feather. The only problem Pluck’s previous plucking has caused, is she seems to have adopted the same bad habit. Her chicks have to be removed from the nest, almost as soon as they start to pin. All the babies feathers are fair game, but especially the top of their head. They come out of the box looking like a teeny, tiny Friar Tucks. I have to remove them soon after she starts this, so the feather folicles don’t become permanently damaged. 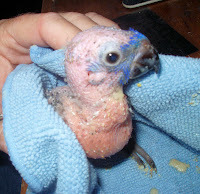 I actually hate to take the chicks from them, and if it weren’t for the plucking, I wouldn’t until they were just about weaned – they both “cry” for a couple days after the chicks are removed. I’m happy to report though, that all of chicks have grown up to be perfectly feathered like ‘Daddy Feather’. Pluck is incredibly shy, retreating to her nesting box whenever I approach. Feather, however is not. His swaying and posturing leave no doubt whatsoever, that should my fingers come just a bit too close, he would gladly rip them open for me. And don’t be fooled, just because Lories are nectar eaters, doesn’t mean they don’t have a beak sharp and strong enough to do just that. If you ever have the opportunity to own a Lorie, breeder or not, you wouldn’t be disappointed. They are a wonderful bird species, whether they view you as parent, friend, or just a tasty snack.